Visitors to Giza never miss the pyramids and Great Sphinx, but often forget to experience a traditional dance performance capturing Egypt's rich artistic heritage. 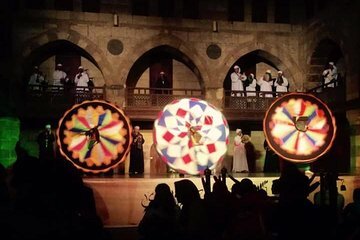 Don't miss the chance to enjoy traditional, Egyptian Tanoura dance with this Cairo folk show experience. After easy hotel pickup, head to Wekalet El Ghoury to watch the whirling dervishes spin in an incredible show, complete with live music.